The London Fly Fishing Fair and London Shooting Fair are just over a week away. Taking place at the Business Design Centre on Friday 22nd and Saturday 23rd March they will be bringing the very best of country sports right into the centre of London. Whether you're a beginner or an expert, or somewhere in between, this is the ideal place to get involved in the sport. Here you can buy equipment and find your next trip from destination's across over the world. The venue is located in the heart of Islington and enjoys easy access to and from Central London by public transport. FishPal have been exhibiting at the show since its inception and believe it is one of the best fishing and shooting shows in Europe. We look forward to seeing you at this years London Fly Fishing Fair. 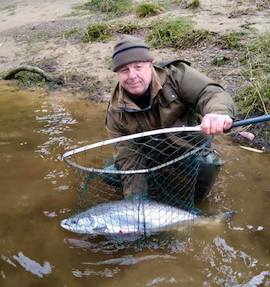 First fish off the River Coquet caught by David Lee. FishPal are now selling availability for the Willow Pool and Cauldron beat on the Border Esk; Knockando beat on the River Spey and Upper Morwick on the River Coquet. Border Esk. The delightful and easily fished Willow Pool and Cauldron beat on the Border Esk is now available on the Border Esk site. Availability starts from £30 a day - read more. River Spey. 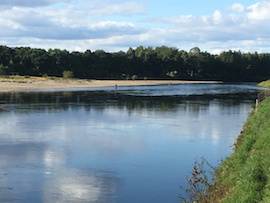 Knockando has three and a half miles of prime double bank fishing on the River Spey, split into three adjoining beats. The estate employs three exceptional ghillies to manage each beat. A days fishing starts from £60 per person for a party of three anglers - read more. River Coquet. Upper Morwick Fishing on the River Coquet is just under two miles of prime salmon, sea trout and brown trout water. Situated only a few miles upstream of the tidal water at Warkworth - read more. If you would like to book a day fishing, or would like to speak to a member of the team about fishing these beats please call the office on 01573 470612. 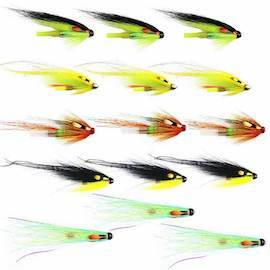 Win a complete selection of Spring salmon flies from Peaks Fly Fishing - read more. Peaks Fly Fishing is one of the UK's leading high spec' fly retailers. They have teamed up with Caledonia Fly Company to offer salmon anglers the very finest quality salmon flies. Especially for FishPal customers they have created an essential seasonal selection designed to catch fish on all UK rivers - read more. One rod has become available on East Ranga during prime time from July 28th until July 31st. Anglers who fished this week last year caught between 15 to 20 salmon each. 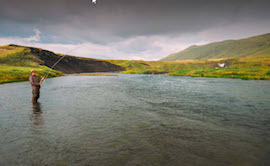 East Ranga was ranked as number Two in catches last season in Iceland. Kercock Fishings is a secluded and stunning salmon fishing beat located on the Lower Middle River Tay. Overlooked by the picturesque hills of the Perthshire countryside Kercock has 2.25 miles of prime double bank salmon fishing hidden away from the noise and stresses of everyday life - read more. Scott Rutherford from Orvis Banchory, fishing Aboyne Castle Beat on the River Dee. The Dee. Ross Macdonald said "Last week we had twenty in the book, bringing us to one hundred for the season so far. Conditions were reasonable, with a lift in water midweek, so I think we could have expected a few more landed" - read more. The Dee are exhibiting at this years London Fly Fishing Fair. Ross Macdonald and the team will be there to chat all things River Dee during the weekend of Friday 22nd & Saturday 23rd March. The Ness. The season is underway and so far it has been a quiet start. Loch Ness have faired better with a few salmon, notably a 25lbr, caught last week. The Ness beats generally don't tend to catch salmon until around mid March - read more. The Tay. The spring run on the Tay system should really start to build over the next few weeks as more fresh fish enter the river. March usually sees the start of more consistent catches on the river and of course being the River Tay; there is always the chance of landing that fish of a lifetime - read more. If you would like to join the exclusive club of anglers catching a Spring salmon, please give Tom a call in the office for beats to try. A days salmon fishing during the next few months can start from as little as £20 a day - find fishing. If you would like to receive any of the reports by email as soon as they are uploaded onto the site you can do so by registering for that report. Alternatively just click on River Reports and you will see them all listed. The award winning Mackenzie G2 and Shooting Head Fly Rods & G2 Fly Lines have been reduced at Fin and Game. Visit their website and grab yourself a bargain. 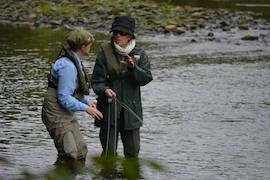 We've been working with local providers on Tweed and the following courses are available this year on the River, including 'ladies only' events. During August, Lower Pavilion fishing are holding two three day courses for salmon and sea trout fishing for beginners and those wishing to extend their knowledge. The courses last for three days and start on Monday 19th August or Thursday 22nd August. The price is £100 each day - read more. FishPal's Anne Woodcock and Kate Innes from the Tontine Hotel are holding a ladies fishing and spa event for anglers and non anglers in October. Ladies will spend the day on Traquair Beat, one of the most popular upper Tweed beats. Much of the 3 mile water is ideal for first time anglers, but there is plenty to keep the experienced anglers happy too. The event is finished off with a morning at the award winning Stobo Castle Spa, crowned the UK's Best Destination Spa at the Good Spa Guide Awards - read more. 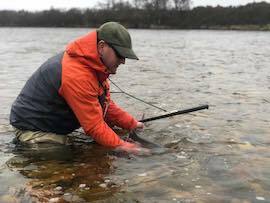 Tweedguide are holding fly fishing schools for salmon, brown trout and grayling on the river Tweed during April and May. Tuition, permits and equipment is included within the cost - read more. The new FishPal site has a list of guides and instructors for Scotland and England. Please mail your fish photos to info@fishpal.com with your name, where you caught it and what fly/lure you caught it on. Please note we are not in a position to post your photos if the fish is on the bank, grass, stones etc. Ideally keep the fish in a net, in the water or as near to the waters surface as possible.